The Maha Kumbh Mela in Allahabad is considered to be the largest human gathering in recent times. Spread across the first three months of 2013, an estimated 100 million pilgrims passed through this sacred confluence to take their ritual cleansing dip. Volumes have been written about the mela, and we have all been witness to an incredible array of photographs coming from the festival grounds. Inspired greatly by the works of legendary 19th century photographers Edward Curtis and August Sander, I attempted to cut out the chaos and document in a dignified manner the ascetics and pilgrims alike. Shooting on a traditional 4×5 Toyo field camera against fabric backdrops that I found on location, my portable photo booth quickly became a spectacle in itself. Using a formulae of ‘one for you, one for me,’ each subject was photographed twice, first on instant polaroid-type film which was given to each subject and second on Black & White sheet film retained by me. Much to my surprise, within minutes of setting up my gear, the word would go around, ‘the photo sewa(service) has begun’ and people would line up en-masse to have their portrait taken. 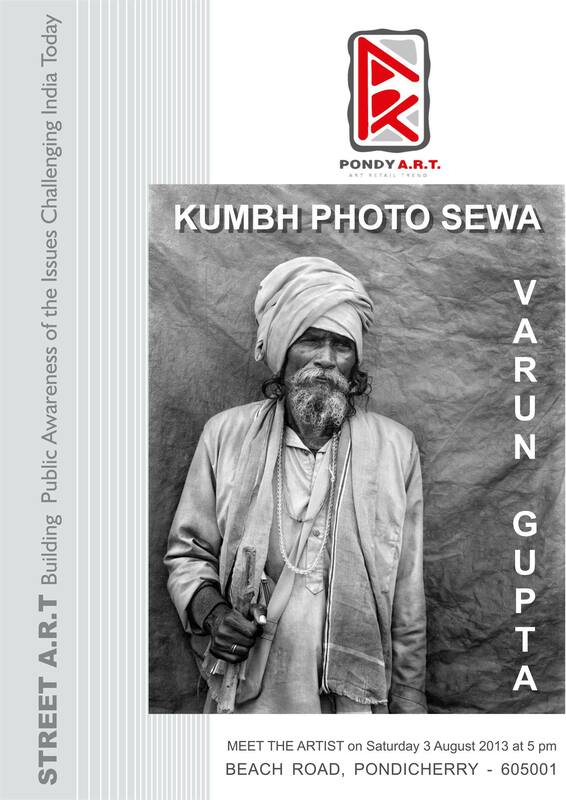 This series of images on display is the birth of project that I hope to pursue at public gatherings across India. To me, the strong posture and body language of each subject represents their perception of themselves, and gives us a window into the pride of the Indian populace. Born in Calcutta to a family of travelers, Varun was exposed to rock climbing trekking and the towering beauty of the Himalayas at a very young age. As a natural extension of his travels, at age eight, he took to the camera to document what he saw. A few hundred rolls of film later, his journey continued with a Bachelor of Arts degree, from College of Wooster in Ohio, a job as an animator in New York, and a Diploma in Photography from Light & Life Academy in Ooty, India. Based out of Chennai, India he works as a freelance professional photographer undertaking assignments in architecture, portraiture, fashion and advertising. His hunger for making images remains a constant in his life, blurring the lines between work and play. His personal work, a reflection of his nomadic existence, evolves with steady progress in its artistic expression. Galleries in Bangalore, Chennai, Kolkatta, New Delhi, Kochin and Pondicherry have shown his photographs.